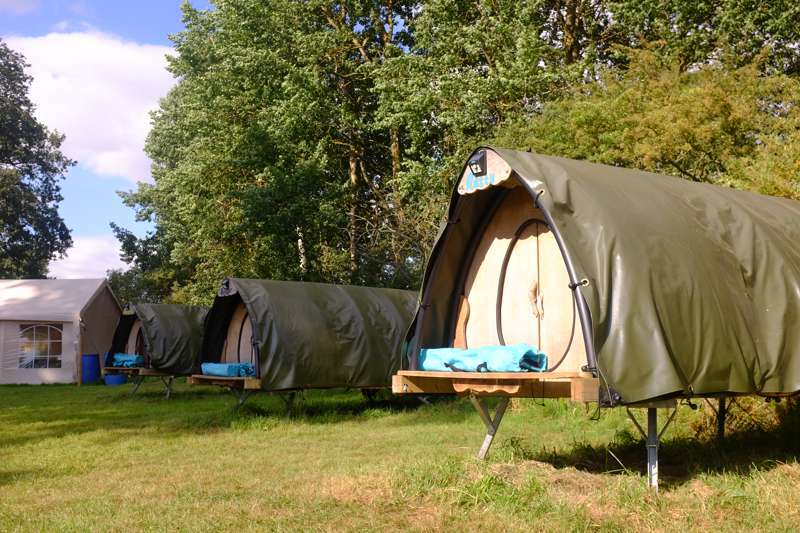 Cosy Cocoon camping pods sleeping up to 2 people. Whole site hire available. It took the Very Hungry Caterpillar an entire week of gorging to spin his own cocoon. For us humans, there’s a far more easy option. 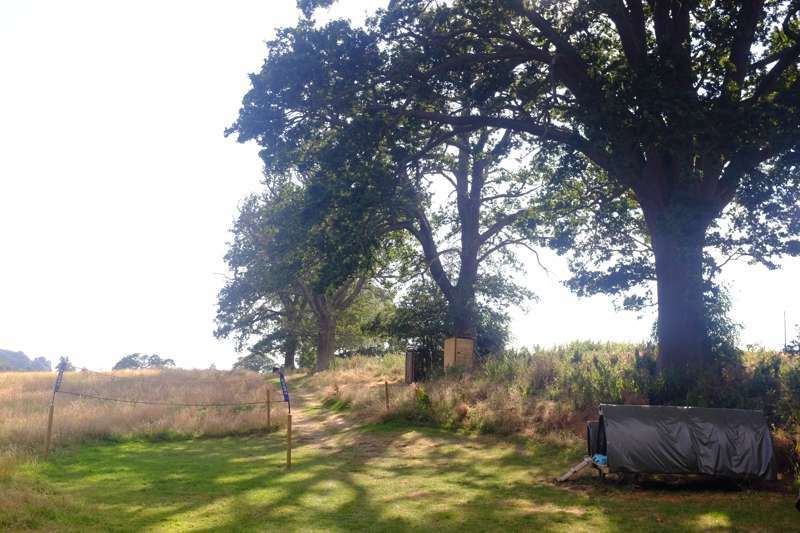 A mile west of Chipping Warden in Oxfordshire, there’s a farm that’s had its very own caterpillar-like carpenters working around the clock to create an enticing glamping retreat. And the finished product is quite the treat: a nest of cosy canvas cocoons with an idyllic riverside setting. Leave your phones behind and get back to the basics – enjoying the company of your friends and family without any digital distractions. At the bottom of a grassy meadow that slopes down towards the River Cherwell, the six cocoons have been gathered together in the meadow with a campfire pit at the centre. Each sleeps two people in a super comfy double bed (allowing the site to accommodate 12 people in total), while an additional kennel cocoon also means you can bring a couple of pets along. At night the raised base of each structure ensures a flat, waterproof abode, while the canvas roof, which can be rolled back to reveal the open sky, allows for unbeatable stargazing when the weather is on your side. The river provides one of the most popular pastimes for children. Guests are welcome to dabble along the water's edge, build dams or clamber in the trees. Cricket, rounders, volleyball and badminton can also be enjoyed on the mown area adjacent to the cocoons – balls, net and racquets provided. Try your hand at catching cray fish too, which are delicious when freshly cooked over the open fire. 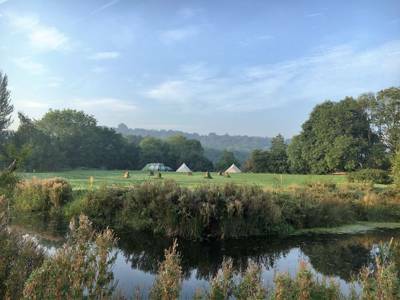 Utensils, pots and crockery are all provided in a white marquee that is pitched alongside the cocoons and you can even invite local chef, Suzanne Smith along, who is happy to provide catering for groups (booking in advance essential). If you do decide to assemble the gang and leave the hidden meadow setting, then a ramble along one of the local trails is a popular option, with multiple long-distance routes on the doorstep – the Jurassic Way, Millennium Way and Battlefield Trail are all accessible. Throw in a handful of the more driveable attractions – Blenheim Palace, Warwick Castle, Bicester Village and Shakespeare’s Stratford-upon-Avon – and you’ll find there’s plenty to do. Or you could only make it as far as the local village itself. There are two friendly pubs that will welcome you with open arms. These eco friendly cosy cocoons are exactly as they sound – warm and snug. 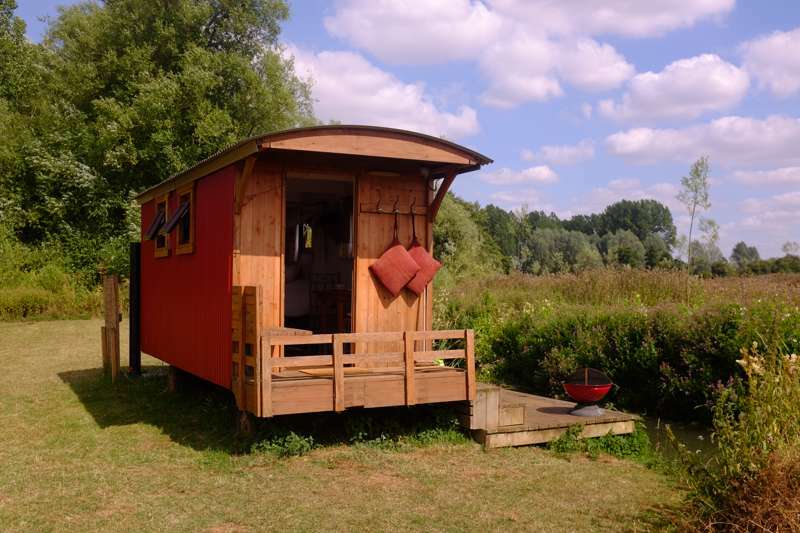 Set in beautiful parkland with stunning views close to the River Cherwell, this is real luxury in the great outdoors. You can star gaze with the canvas up or hunker down with the insulated roof protecting you from the elements. The cocoons all have an ultra comfortable, fully sprung double bed so that you can enjoy the surroundings whilst lying in luxury. Get back to nature and de-stress. Go home feeling refreshed and invigorated – good for the soul! For latest availability and best prices for Cosy Cocoons, please use the Date Search above. 6 cocoons, each sleeping 2 people. The whole site can also be hired exclusively. 6 cocoons (each with a double bed; linen provided at extra cost), 2 loos, 1 shower. A big communal firepit (wood provided). Cooking pot and cooking facilities. Dining marquee with table and chairs. 4 bikes for hire. Trees to climb and river to paddle in. Farm animals and horses to stroke and feed. Badger watching and bird life in abundance. It’s a 30-minute drive to ‘the city of dreaming spires’, where you can explore the various Oxford colleges and quads on foot, admiring the architecture, or try your hand at punting (01865 515978). Shakespeare’s Stratford-upon-Avon is around the same distance – worth a visit not just for the theatres and Shakespeare-centred history, but also as an attractive little town in its own right. Just beyond, Warwick is particularly popular for its well-kept Norman castle (08712 652000) – family activities run throughout school holidays. 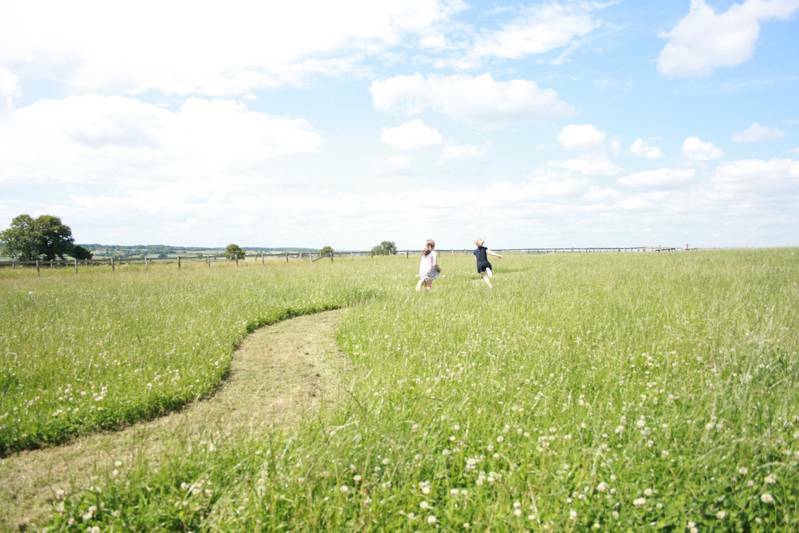 Closer to home, enjoy walks directly from the Cosy Cocoons glamping site. There are several local footpaths along the riverside, while long distance routes – the Jurassic Way, Millennium Way and Battlefield Trail – are also accessible. Cosy Cocoons work with a local chef who, with enough notice, can prepare food for grilling over your campfire or proper sit down meals for dining around the table. You'll need to organise it a little in advance, so get in touch before you arrive, but for big group gatherings its a convenient addition to the itinerary. As for dining out, The Griffin (01295 660311) in Chipping Warden is an easy 15-minute walk away – it's dog-friendly and serves hearty pub food – or, if you want to really treat yourself, the renowned Butchers Arms (01327 260504) at Priors Hardwick is only a 15-minute drive. May – end of September. £60 per cocoon per night (includes 2 people). 1-night stays are £80 and bank holidays are also £80 per night. The whole site can be hired of groups from 6-12 for the same rate, with an additional flat rate of £200. 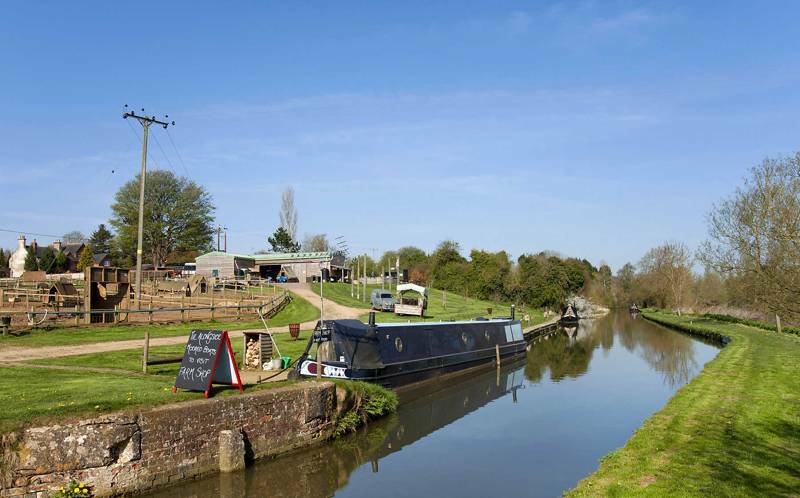 From the M40, leave at junction 11 and take the A422/A361 exit to Banbury. At the roundabout, take the 3rd exit onto the A361 to Daventry, then turn right onto Culworth Rd at the Aston Le Walls crossroads. Turn left opposite the barn conversion, through a green gate (Sat Nav users will be taken to this barn conversion with the postcode). Go through the green gate – it will open when you drive up to it. The sign says 'Blackgrounds Farm'. Go down the long drive, turn left and park around the back of the farm buildings. There is a walking track to the cocoons or in dry weather a car can be taken down and luggage dropped off before parking the car back at the yard.